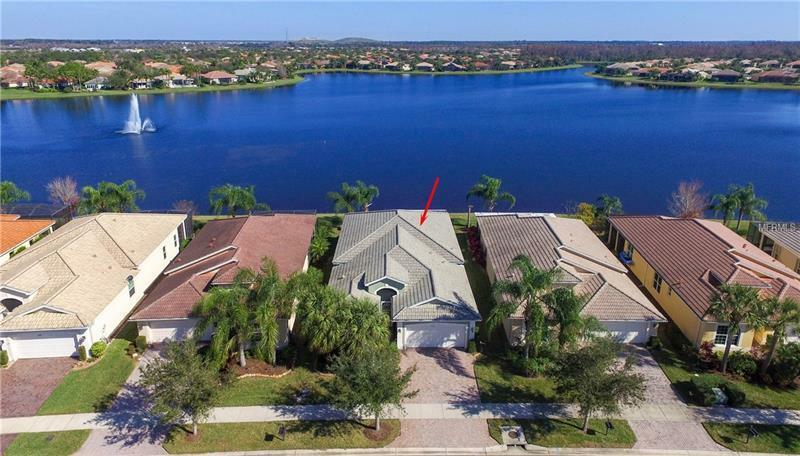 VALENCIA LAKES WATERFRONT - BEAUTIFUL 26'x22' FLORIDA ROOM - 2629sf | 2 Bedrooms | 2 Full 1 Half Bathrooms | 2-car Garage. Home located on the bank of 40 acre lake with remarkable water views! Built in 2010 with many upgrades and add-ons including among others: 11' ceilings recessed lighting crown moulding throughout wood trimmed passageways wood framed windows wood framed transom windows wood floors in bedrooms/office chair rail water softener & more. Master Bedroom features: tray ceilingprivate sliding glass doors opening to Florida roomplantation shutterscustom made transom window designswater views. The ensuite bathroom: his/hers wood vanities + WIC wood framed mirrorsjetted tub and walk-in shower (tiled to ceiling + bench). Home truly is invitingbeautiful and you'll love the water views. The entrance foyer has inlaid border tile for added charm and prestige. Formal living room has built-in 8' library bookshelves with center ed electric fireplaceplantation shuttersarched transom window and recessed lighting. Additionally there is a large office with double pocketing doorscraftsman high quality built-in desks and cabinets. Valencia Lakes is an exceptional 55+ resort fashioned community designed to meet or exceed all of your hopes and expectations. Community: grand style clubhouseprofessional entertainment (booking local and national acts on tour)restaurant resort super pools super fitness room clubsshowcasesseminarsRV storage manicured baseball field...much much more. Pet Restrictions: Specific breeds restricted. Please see Rules and Regulations.